It’s the season of rebirth and renewal, so why not take the time to get organized? 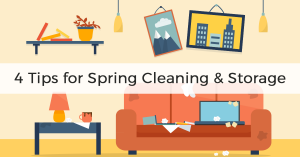 Many people look at spring as the perfect time to undertake the annual ritual of cleaning their home or workplace and storing what they’re not going to need until the weather gets cool again. It can feel like a massive undertaking but there are tools out there to make it easier. A little common sense and some planning will help you get organized and a storage unit will make the whole process easier. That’s where A.B. Richards comes in. We can give you the portable storage units you need for your spring cleaning and storage. Whether it’s one of our 20ft storage containers, which can fit on most residential properties. Or a 40ft storage container which is good for commercial sites. If you have larger more awkward to store items, you could choose our 40ft Jumbo containers that have an extra foot of headroom. A.B. Richards can serve all of your storage needs and we want to help you out by giving you some tips on spring cleaning and storage. The first trick to getting organized and starting your cleaning and storage project is to come up with a plan. “Without clarity of a plan or a goal, there is a tendency to be overwhelmed with the task of organizing,” Elaine Fernando, a professional organizer tells the website, Best of NJ. Plan your cleaning job by starting small. Look at the quick and easy jobs that easily fit into a storage unit. You can tackle first before going after the more difficult projects. It’s also important to be prepared to get rid of stuff. Throw it out or donate it, but cleaning and decluttering go hand in hand. Be sure to separate items that are going to be thrown out from what you’re keeping. Now that you’ve separated what’s going and what you’re keeping, it’s time to find a place to store what’s remaining. Using a portable storage container from A.B. Richards is an ideal way to put away items you don’t need until the winter. Among the things you might consider packing away are snow shovels, as well as rock salt and ice scrapers. If you haven’t already packed away your holiday decorations, now is the time to do it. If you have athletes in the family, it’s time to pack away the skates and skis. When storing winter clothing, make certain to wash everything first to get rid of oil and dirt that could attract pests in your storage unit. Fold your clothing if you can, as hanging items such as sweaters can stretch your clothing. Keep clothing out of direct sunlight and in a cool dry place. If you’re looking to guard against pests, cedar oil is recommended over moth balls. A.B. Richards loves helping you get organized and we also make it convenient for you. Instead of having to cross town or go past several towns to look for a remote storage facility, A.B. Richards will bring our portable storage containers to you. We’ll also pick them up without charging extra. Contact us today!